Picis PulseCheck creates an advanced set of integrated solutions for emergency departments, for hospitals around the world. These solutions facilitate the delivery of clinical documentation, and financial and operational results. With over 20 years of experience, Picis PulseCheck solutions cover millions of emergency care visits each year. With such a large and varied suite of products, Picis PulseCheck utilized ActivePerl in order to maintain a consistent development environment. With its vast scripting capabilities, suitability for manipulating large amounts of data, and ability to deftly manage database applications, ActivePerl is well suited to maintain and manage the Picis PulseCheck Clinical Solutions. ActivePerl, with its stable and advanced support for Windows, enterprise- grade precompiled distribution, and commercial support was ideal for a large and innovative organization that needed the peace of mind of a commercially-backed solution. However, Picis PulseCheck required a more custom solution in order for their particular Apache and SQL setup to function correctly. As a result, Picis PulseCheck decided to incorporate mod_perl, an optional module for the Apache server, which embeds Perl interpreters into that Apache server. Yet this solution soon proved to be the source of many new problems–it resulted in severe memory leaks and performance issues which took down servers and ground the software system to a halt. The memory leak issues proved unworkable and ultimately mod_perl had to be removed from the system to prevent further catastrophic issues. After removing mod_perl from their system, Picis PulseCheck began looking for an alternative solution. Since ActivePerl was already working seamlessly in other areas of their business, they began to explore ways that ActiveState could help. The answer lay in ActiveState’s OEM solution, known for its custom builds, quality assured code, and comprehensive technical support. Picis PulseCheck turned to ActiveState’s Professional Services team to see if they could create a custom solution to solve this critical issue. Picis PulseCheck and ActiveState decided to work together to see if they could solve the Apache/SQL issues with a modified version of ActivePerl. 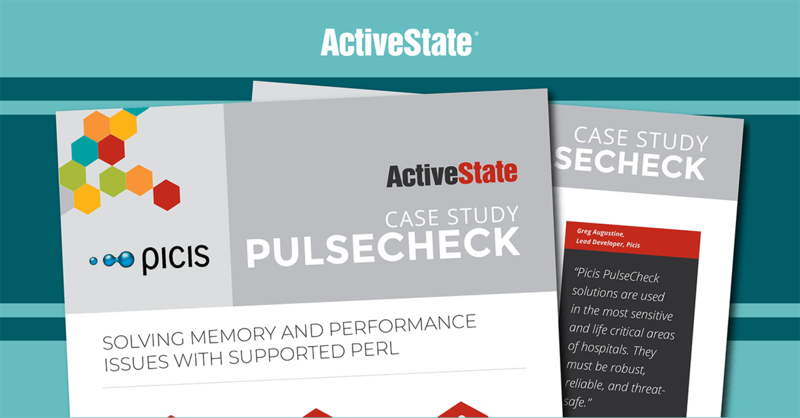 ActiveState quickly delivered a custom ActivePerl 5.16 solution that enabled Picis PulseCheck to use SQL with their Apache Server, without relying on mod_perl or any other third-party products. Picis PulseCheck successfully upgraded to ActivePerl 5.16 and have since maintained that version. It is a solution that perfectly suits their needs– Apache and SQL work well together with no memory leaks, and all the rest of their Perl needs are met. Picis PulseCheck prefers to work with ActiveState’s enterprise-ready ActivePerl distribution because of it’s stability, custom capabilities, and superior customer support. Picis PulseCheck excels at clinical solutions for hospitals and other critical care facilities. Their expertise is not in maintaining open source software– they prefer to leave that to the experts. ActiveState maintains ActivePerl for them, responding to support requests, and providing up-to-date security patches so Picis PulseCheck can focus on what they do best: develop cutting edge software that helps hospitals run more efficiently and saves lives.